Lucien tells you to deliver the Staff of Armadyl to him from the Temple of Ikov, located immediately south-east of the Ranging Guild. He gives you his pendant, equip it and head to a bank and bank all of your items except a light source, a knife, and Lucien's pendant equipped. If you already have the Boots of Lightness, you can leave the knife and lightsource in your bank and you can skip the next bullet paragraph. Make sure you weigh 0kg or less by equipping the Boots of Lightness. Enter the temple by climbing down the ladder surrounded by 4 statues, once inside head west and climb down a set of stairs. Once inside this room, assuming you have your light source and knife, head to a corner north-east in the room and cut some spider webs and take the Boots of Lightness. Equip the Boots of Lightness and check your weight. If you weigh more than 0kg, run back to a bank and bank everything. You should only be wearing the Boots of Lightness and the Pendant of Lucien. Enter the temple by climbing down the ladder surrounded by 4 statues. Go west and enter the area past the northern gate. Go north-west crossing a bridge, and pick up the lever on the ground (If you weigh more than 0kg, you will fall and take damage trying to cross the bridge). Run back to the temple entrance and use the lever on the Lever Bracket on a western wall near the ladder, then flip this lever. Now go through the southern gate and follow the tunnel system north, turn on Protect from Melee to make this section easier as Ice Spiders may attack you. This section of the temple has a few chests hidden in some nooks along the walls, keep running around searching these chests for Ice Arrows. Get 25 or more Ice arrows, equip these arrows, and then exit the temple. Go back to a bank, withdraw 20 unnoted limpwurt roots, a prayer pot or 2, and equip a yew, magic, or dark bow. You may also equip some range armor as well. Run back to the temple and enter it, go past the north gate and run north into a room with two trapdoors and a lever on the northern wall. Search the lever for traps and then pull it. Now run west and enter a room, and then try to open the door to the north. A level 83 Fire Warrior of Lesarkus will appear and prevent you from moving on. Kill him using your bow and Ice arrows, using Protect from Magic will make the fight easy. Open the door now and talk to Winelda by the lava. She'll take your 20 limpwurt roots and send you across the lava gap. Now go north, then west, and then south past several Lesser Demons; pick up the shiny key here. Now run back north-east and push a stone wall to enter a large room with some Guardians of Armadyl. Take off your Pendant of Lucien now. You now have an opportunity to aid either Lucien or Armadyl. You've gone here to help Lucien right? Go to the north-eastern room and try to take the Staff of Armadyl. A level 43 Guardian of Armadly will attempt to stop you, kill him and take the staff. Run out of the room and exit by using a ladder to the east. You'll end up in a house right by McGrubor's Woods, your Shiny Key let's you open the door to this house. 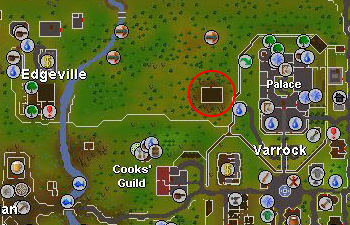 Head over to Edgeville or Varrock and go to the house circled in red in the image below. Give the Staff to Lucien and the quest is complete. With your Pendant of Lucien unequipped, talk to a Guardian of Armadyl. Talk to them about the staff and Lucien, and tell them that you want them to bathe you. The Guardian will give you a Pendant of Armadyl, equip this Pendant. The guardian also tells you to kill Lucien. Head over to Edgeville or Varrock, go to the house circled in red in the image above. 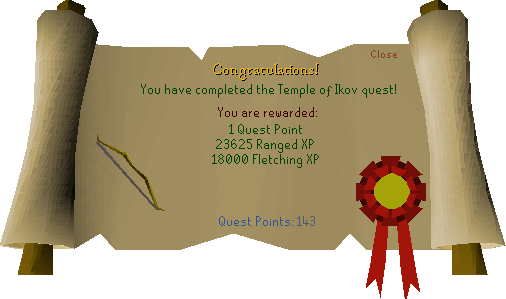 Attack Lucien, while wearing the Pendant of Armadyl, and the quest is complete.